I had the pleasure yesterday of hearing a talk from Suresh Canagarajah, who always helps me refresh and re-imagine my ideas about language and movement in a cross-cultural world. Yesterday he was discussing more of his ideas about how language use is negotiated in ways the challenge concepts of monolingual standards and center-periphery conceptions of English usage. I am convinced when he argues that, around the world, people make adjustments in conversation that allow them to make meaning without concern for abstract ideas of correctness. Where Suresh talked primarily about face-to-face conversations or hard-copy written texts, I found myself thinking about the ways I have seen similar negotiations online. When I look at popular culture fan sites I often find the people posting come from a range of different cultural and linguistic backgrounds. Though they may be writing in English (or, more to the point, in Englishes) there is a not a single set of usages that govern the conversation. Instead, usage varies from all participants, those for whom English is a first-language as well as those for who it isn’t. But there are two things I find particularly interesting. First, the kinds of negotiations that Suresh has found in his research in face-to-face settings often take place in online discussions, and it’s fascinating to track the back-and-forth of negotiations over words or usage until a meaning is found that satisfies the participants involved. I’ve written about this before, but still find it interesting to watch how it happens and the patience and generosity – rather than judgment or exclusion – that participants usually show each other. What I find perhaps more intriguing is the way in which conceptions of space from different scholars come together in these moments. Suresh talks about how the “translocal space” is a more useful conception of where these negotiations of language take place than the idea of “place.” He sees place as a static, bounded concept that does not offer the same vision of space as an environment where things happen – interactions, negotiations, meaning making. What I find interesting is to overlap this theorizing of space with Gee’s ideas of online “affinity spaces” where people gather online, drawn by their interests in common popular culture texts more than their conceptions of home identities. (As I’ve said in the past, I think identity plays a significant role in the creation and reproduction of affinity spaces, yet I do agree with Gee’s idea that it is the pop culture text that becomes the primary point of contact in such spaces.) If we think about the way online and cross-cultural affinity spaces are also translocal spaces of language contact and negotiation, it raises interesting questions of how the popular culture texts help mediate and facilitate these negotiations of language and meaning. Not only do the popular culture texts draw individuals together online, and across cultures, but they offer both a common cultural and linguistic touchstone for the participants. 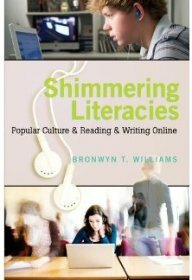 The pop culture text provides common content, rhetorical structures, and language that participants use as a resource and catalyst for their communication. Obviously there are issues of power, of identity, and of language that still need to be worked out here, but, again the question of spaces comes up again. More on this soon. Thanks for reading. Next Job Opening – Associate Professor, Digital Media, University of Louisville, Fall 2012.